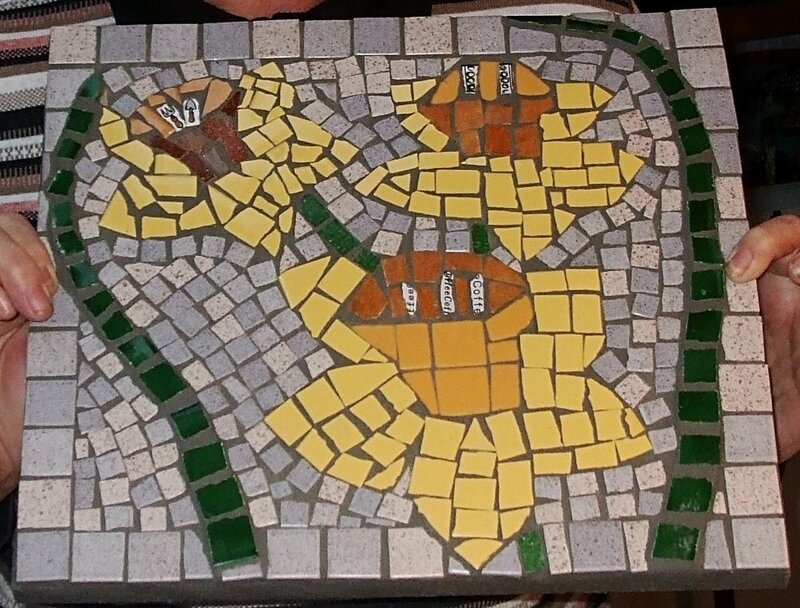 Mosaics created by students on a beginners' two-day course at Classical Mosaic. 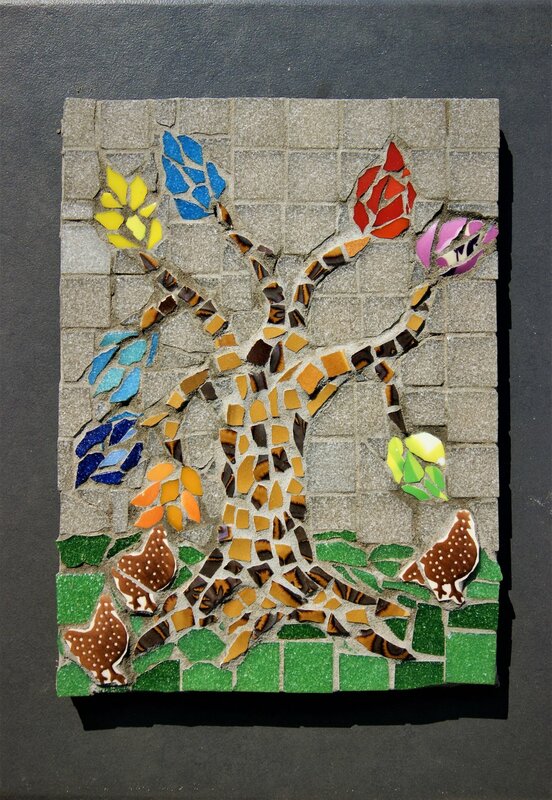 Student's WI first prize winner. 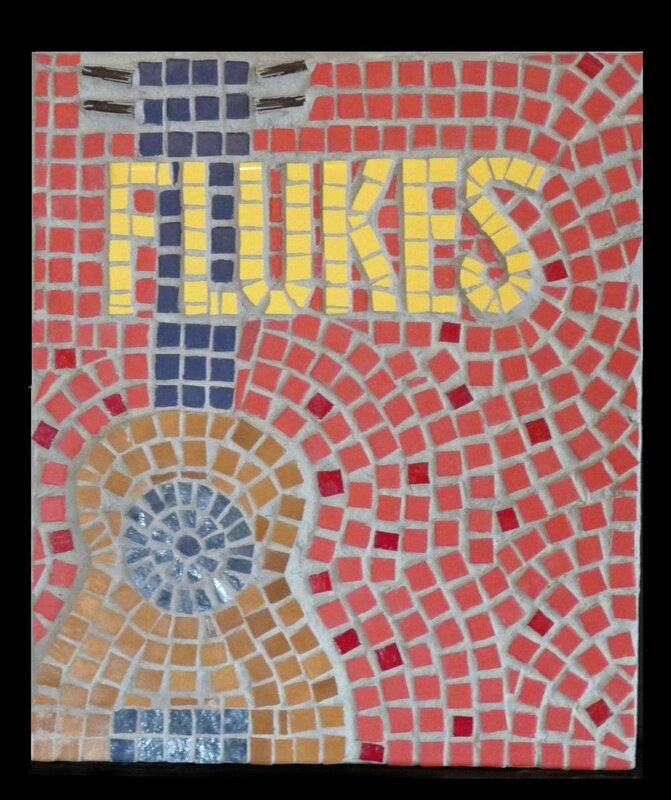 Ukulele band "Flukes" poster in mosaic. 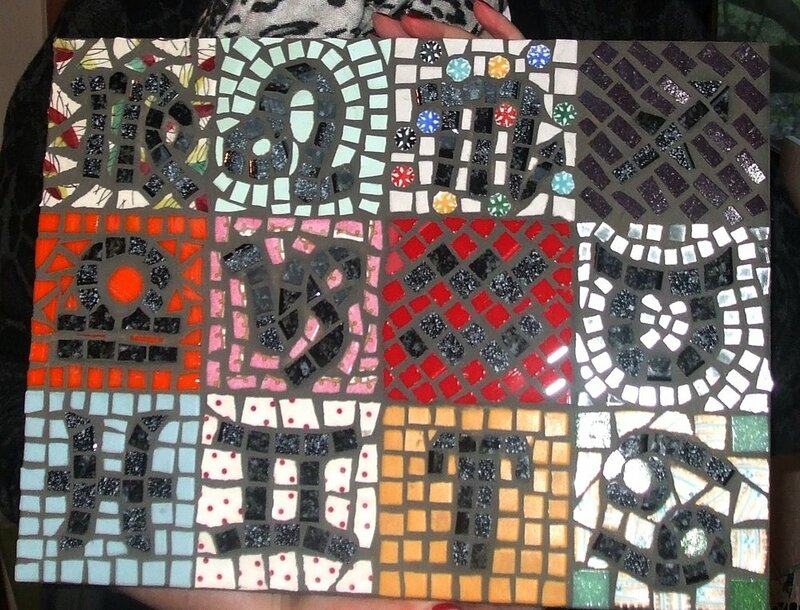 The mosaic is built in the “indirect” method (upside down). 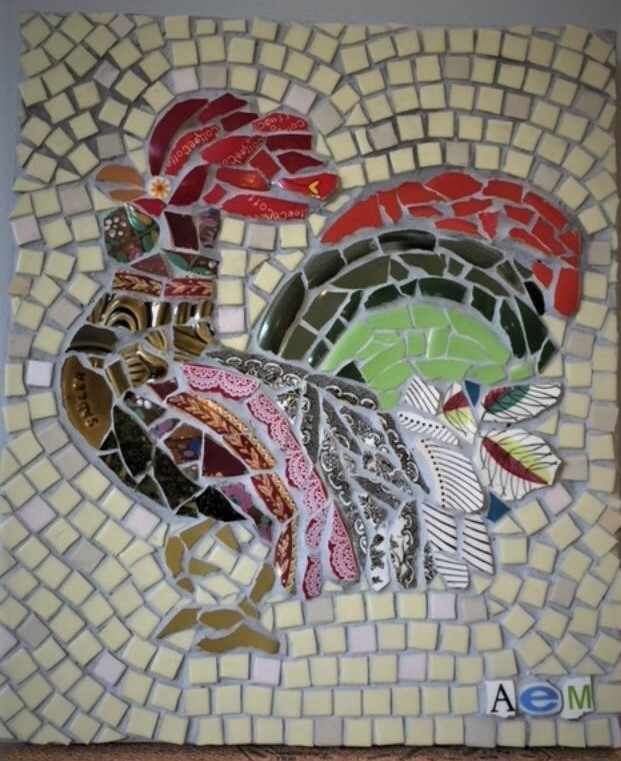 This allows for a completely flat top surface while using a variety of tile thicknesses and recycled crockery, in the mosaic build. Traditional Roman cutting method using the hammer and hardie at Classical Mosaic. First though we learn the basic skills using modern tools. 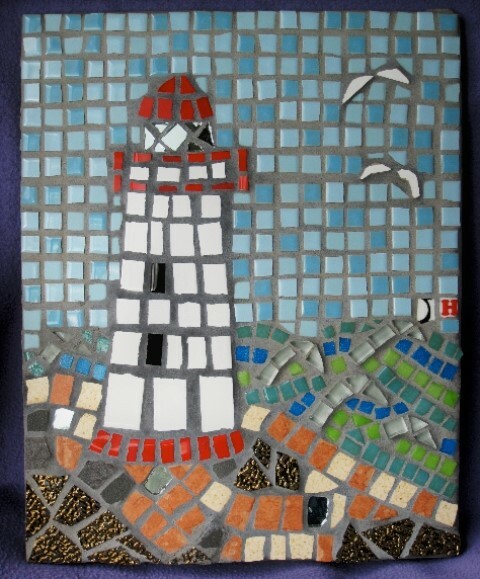 Abstract themes work very well in mosaic... Picasso, Miro, Matisse all inspire the students. 2006 a big year for me! Broken china and porcelain ready to be recycled into a mosaic dragonfly. 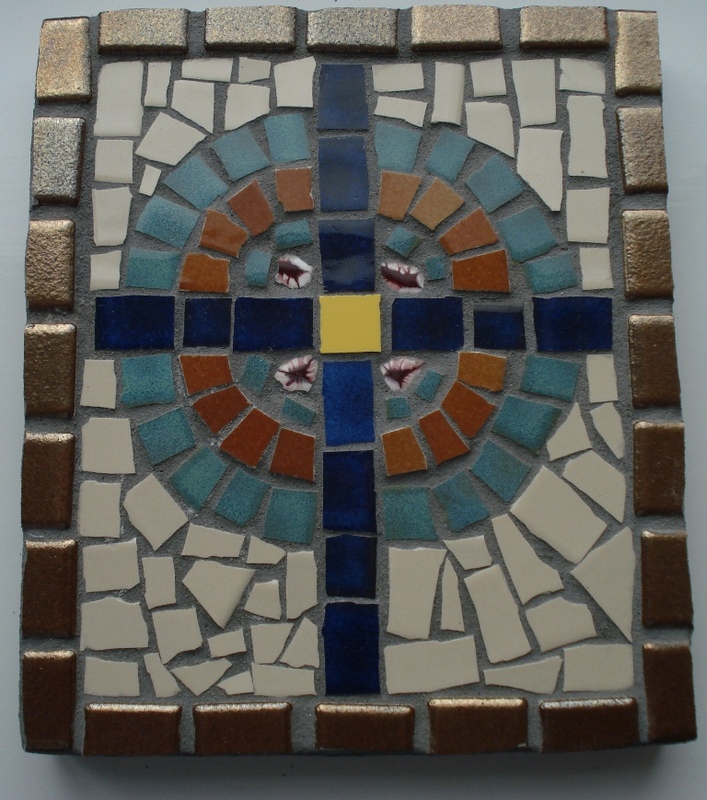 Completed on a recent Classical Mosaic course. Thanks Tricia for a FABULOUS COURSE. 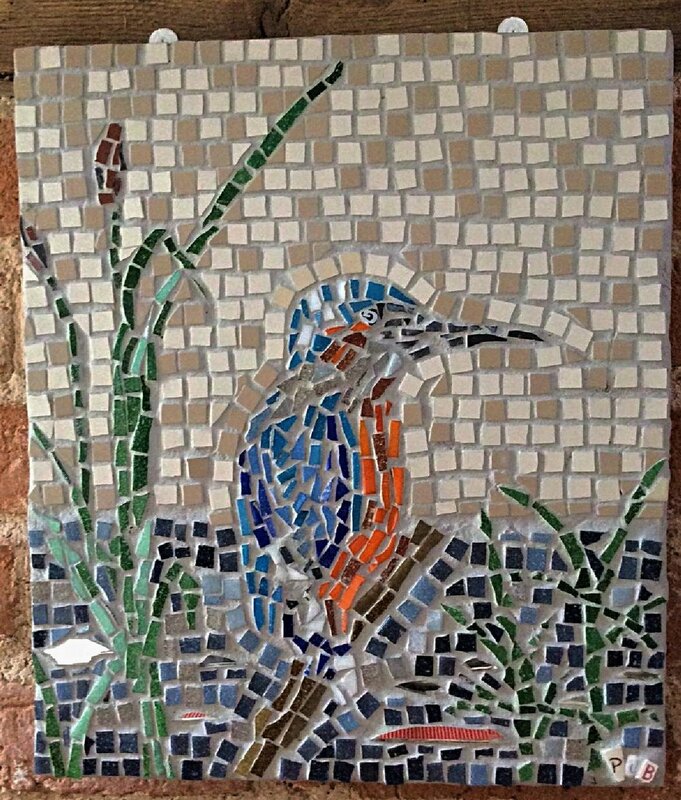 I genuinely think you are an amazing woman, spreading the joy of making mosaics. — Cat B.
Thankyou SO much for the mosaic weekend. I loved every minute and learned such a lot from you. You are truly inspirational! Add to that the B&B, lunches and hospitality and it all added up to a superb couple of days. I'm attaching a picture of my fish which I absolutely love! My husband said only this morning, "If I'd seen that for sale, I would have bought it." If you knew him you'd understand that's praise indeed! — Kathryn B. 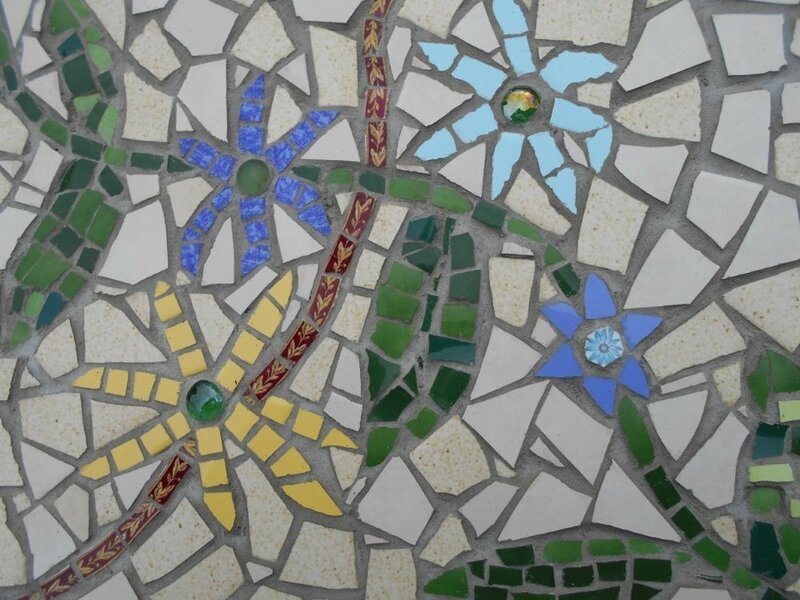 The mosaic garden slab course is over two full days in the studio followed by a half-day one week later (when the cement has cured sufficiently to be able to remove the slab from the wood frame). The half day can be arranged to suit. 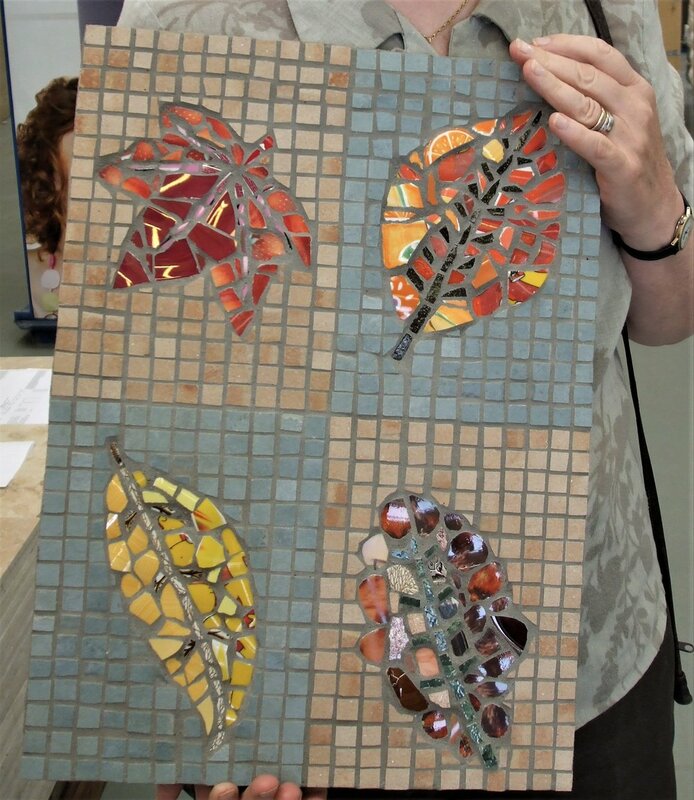 Students wishing to try the garden slab mosaic course should preferably already have some experience in mosaic making. 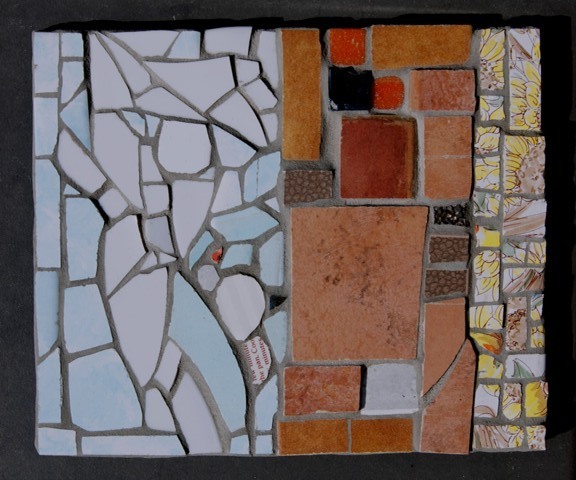 We use the “indirect” method for the slabs where the tesserae are initially temporarily fixed upside down onto the paper base which has your design template, then back-filled with cement and an aluminium mesh for tensile strength. The excitement mounts for the big reveal when the mosaic slab is removed from the frame, the slab turned over and the paper peeled away. 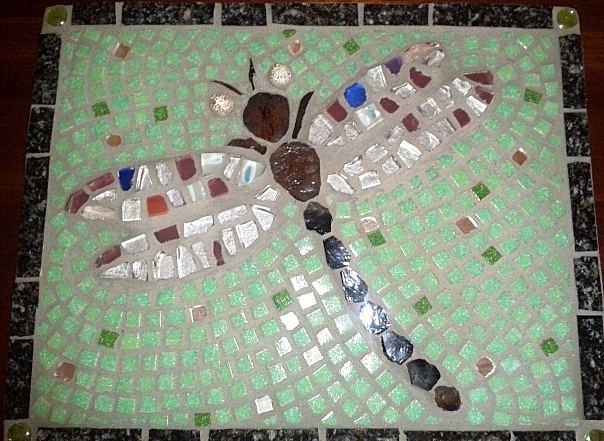 After a little grouting and polishing, the masterpiece is now in full view! As we use only weather and frostproof materials the garden slab is suitable for outdoor siting: in the ground on a driveway or footpath, in gravel or a soil bed, in a lawn, or perhaps cement fixed to a wall. The possibilities are endless. 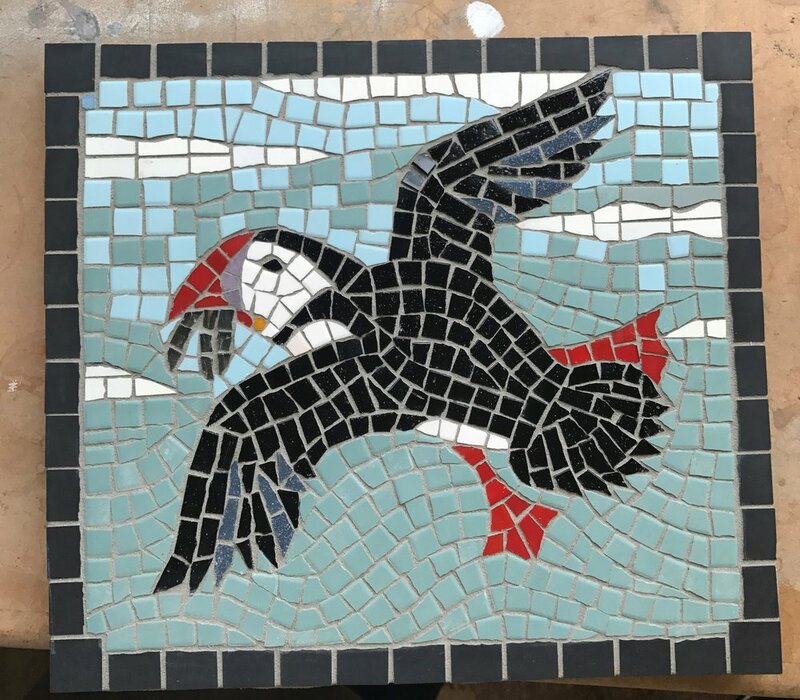 If you would like to discuss mosaic commissions for your business or home, or are looking to join one of my mosaic workshops please get in touch. 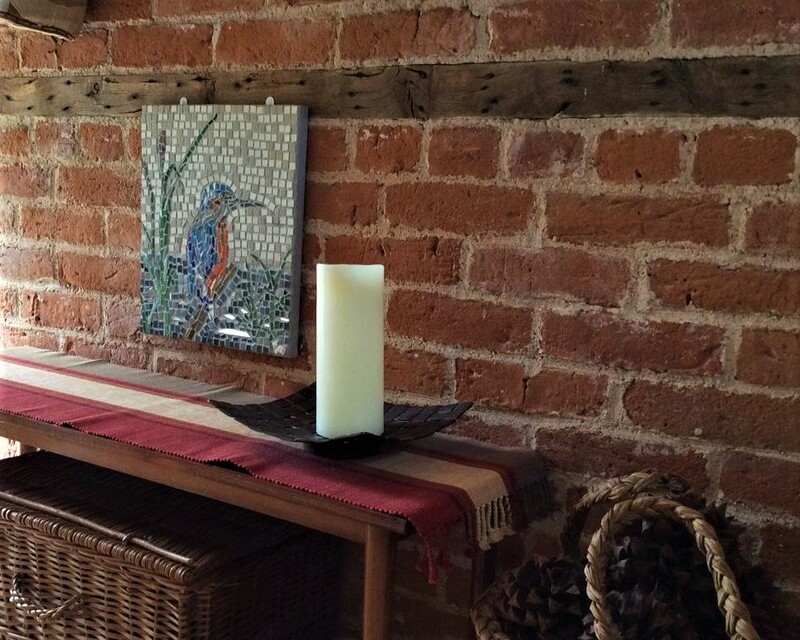 We offer B&B accommodation in our home for our workshop participants, with their partners and friends. If you are interested in alternative dates please let me know. I am very happy to run workshops at any time of the year. 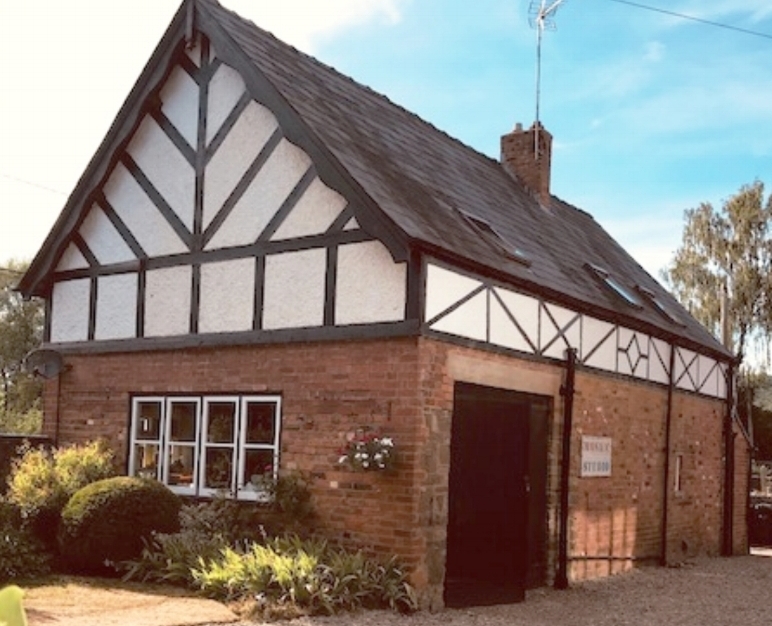 We live in a large country house which started out as a 16th century farmhouse and was extensively enlarged in the late 19th century. We have our own walled Victorian vegetable and fruit garden, beautiful lawns and patio areas in which to relax and enjoy BBQ evenings. 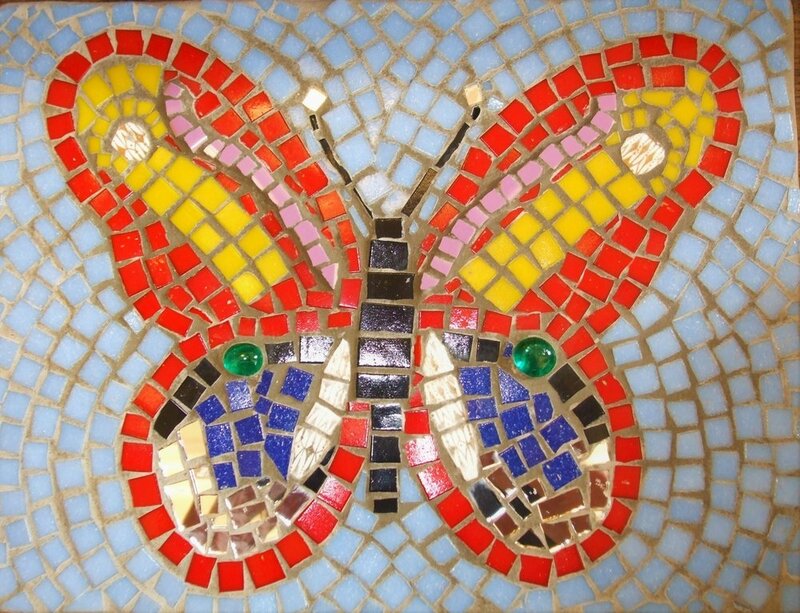 After a hard day being creative in the mosaic studio, there is truly nothing better than sitting in the garden on a balmy summer's night, or in front of an open log fire in the lounge on a cold and frosty evening, fellow mosaic artists and friends around you sharing the day's creative experience, glass of wine in hand and relaxing. A little corner of heaven here in beautiful Herefordshire. Please go to our contact page to book.